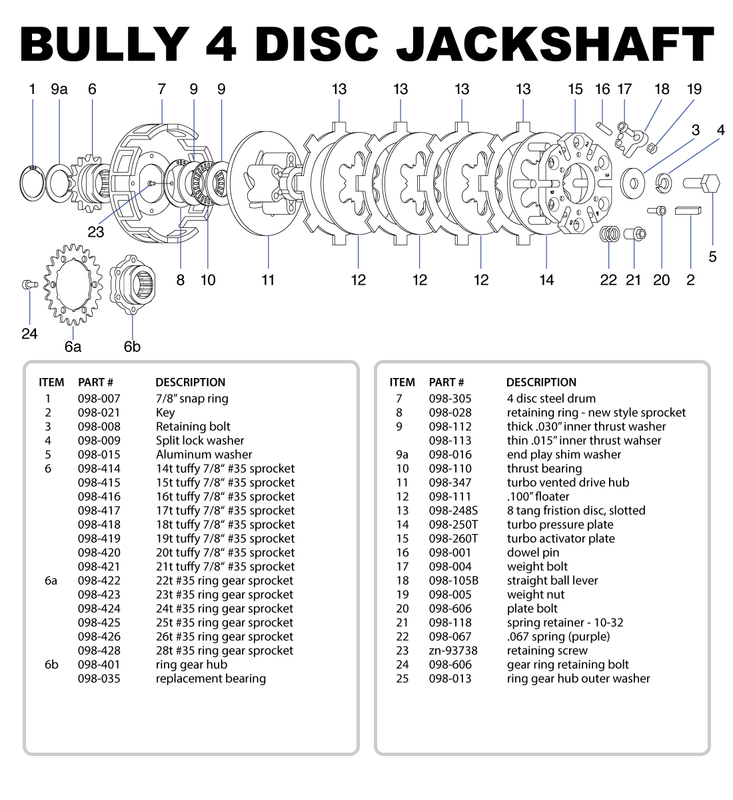 NOTE:The Bully jackshaft clutch is only intended for use on two-stroke powered competition race karts. It is to be mounted on a 3/4” jackshaft which is geared to run 2.71 times slower than the engine. The proper method of achieving this is to use a 21 tooth belt drive pulley on the engine, and a 57 tooth driven pulley on the jackshaft. The shaft itself needs to be drilled and tapped on one end for the 5/16” fine bolt provided. Sprockets available for the 4 disc clutch run from 14 tooth to 30 tooth. 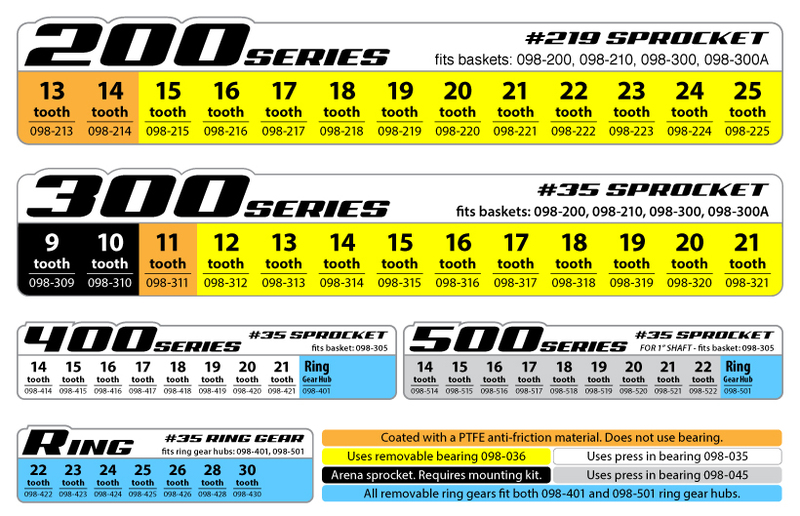 A gear chart is included with the clutch with the ratios for each of these sprockets. The air gap is the clearance between the friction disks. It is measured with a common feeler gauge and is stated in thousandths of an inch. When new, the Turbo Bully clutch is preset between .030” and .035”. During break-in it is expected to see the air gap grow approximately .010”. For most applications the clutch will perform at its peak with an air gap between .040” and .055”. When this dimension is greater than .065” the floater disc should be changed to a thicker unit to restore the air gap back to the original dimension. See Figure 2. As mentioned earlier, spring height will effect the engagement RPM of the clutch. We suggest making equal adjustments to all 6 springs of 1/4 turn increments at a time. The spring diameter, preload, weight package, engines power and several other variables all will effect how much of an RPM change is found with a 1/4 turn change but an average change will be approximately 100 RPM. Turn the spring adjustment clockwise for more slip and counter clockwise for less slip. The range of adjustment should be between .140” and .330”. This is the distance between the bottom of the spring retaining washer and the top of the activator plate. Redesigned 4 disc 6 spring Turbo Jackshaft clutch. Fits 3/4" shaft. 098-111 - Floater - Turbo .100"
.100 floater disc for the 3 and 4 disc Turbo Jackshaft and 1" Turbo clutch. 2 floaters required for the 3 disc clutch and 3 floaters required for the 4 disc clutch. Floaters are priced and sold individually. 098-122 - Floater - Turbo .110"
Bully .110 Turbo floater disc. 098-121 - Floater - Turbo .120"
Bully .120 Turbo floater disc. Pressure plate for 3 and 4 disc Turbo Jackshaft and 1" Turbo Clutch. 6 Spring Activator Plate for 3 and 4 disc 1" Turbo clutch. Vented drive hub for the 3 and 4 disc Turbo Jackshaft Clutch.